The E9x family of BMW 3-series cars (among others) came with an all new line of engines, beginning with N rather than the previous M and S model designations. The 6 cylinder power plants have a few design features to make them more efficient in terms of power, fuel consumption, and emissions. However, like most modern engines, there is a pretty glaring trouble point, the water pump. 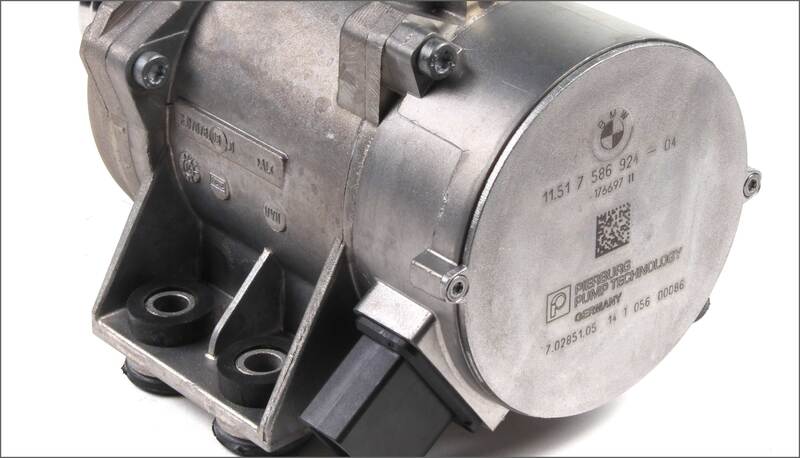 These BMW’s utilize an electric water pump to allow computer controlling of coolant flow, rather than an engine speed dependent pump that saps drive power to run. You can tell the difference by simply looking at them. The non-turbo cars get a full metal water pump where the turbocharged N54/N55 6 cylinders use a two part composite/aluminum pump. If you are doing this job on an N51/N52 car, then you will notice the thermostat coming out is aluminum. It seems that part is now only available in plastic composite. The 135 and 335s came with a plastic composite thermostat from the factory. Unfortunately, both of these pumps only last around 50-80k miles from the factory, and since they are a little tricky to replace, can cost a huge amount of money to do preemptively at the dealer. eEuroparts carries a water pump kit that fits these 6 cylinder engines, and contains everything you need to keep your car reliable and happily on the road. The Pierburg part with the Genuine BMW Roundel. Save by buying OES. 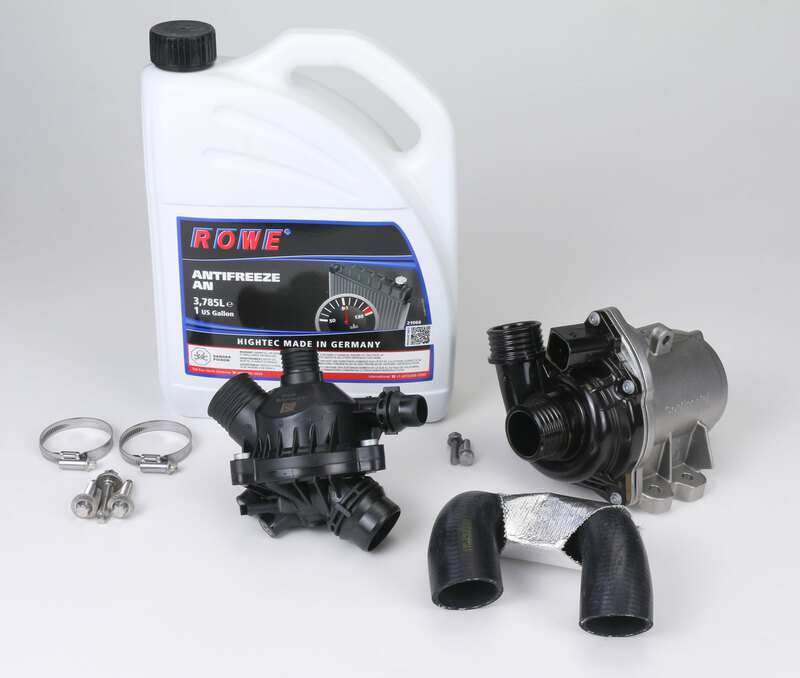 The kit contains everything you need to effectively change the water pump on your BMW at a much more effective price point. 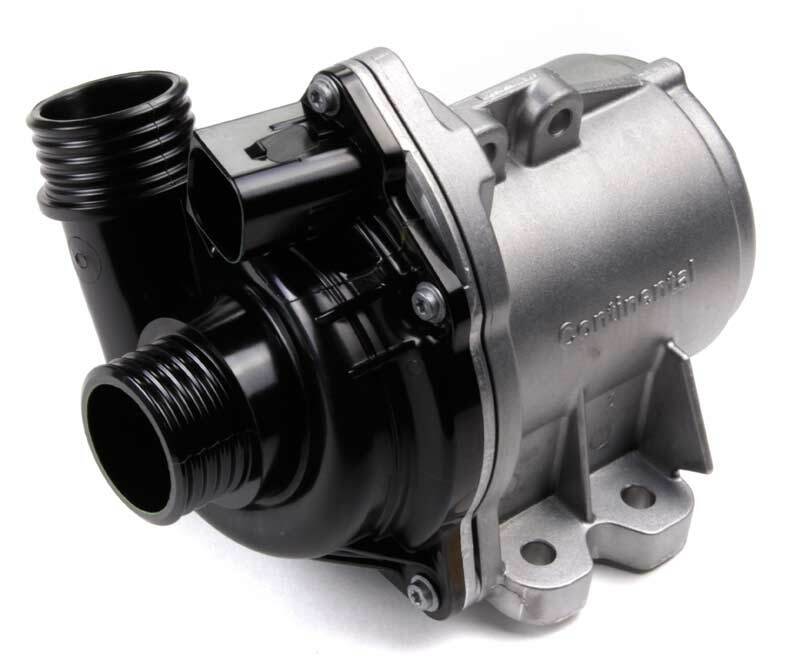 The Pierberg water pump is the original equipment brand, at a significant savings over Genuine BMW. The thermostat is a German made Wahler with integrated temperature sensor, another reputable company that supplies many car makers with their OEM parts. We also carry the OES Behr unit if you like. This eEuro E90 Electric Water Pump Kit also features the water pump-to-thermostat hose, some high quality Genuine BMW hose clamps (trust me, you don’t want to use substandard hose clamps), and the very important E12 aluminum bolts that are specifically one-time-use. Reusing the water pump bolts is a risky situation, especially since the location is tricky to get to if you snap one of them off. German Made ROWE coolant and thermostat bolts are also included. These kits are basically the same, with a few subtle variations in part numbers. The pumps are still OES, although BMW changed suppliers for the redesign, so our OES pumps are VDO rather than Pierberg. There are subtle changes in the thermostat as well between the N54 kit (100K10365), and N55 kit (100K10324). Also included are the hose, clamps, hardware, and ROWE coolant. If you are mechanically inclined and are able to do basic mechanical tasks, this job is DIY capable. It is a little finicky, so for the average DIYer, put aside a day for this job. Savings on doing this yourself with the eEuro E90 electric water pump kit can go past $1000 depending on the shop. With the car safely in the air, you will see the pump behind the sway bar and power steering gear. The first thing you want to do is disconnect the power steering cooling line from the bracket and pull it down out of the way. Continue on by disconnecting the sway bar bushings from the subframe and let it swivel down. Bungee it out of the way to keep from whacking your head on it repeatedly. Do you have a kit for the 335xi 2009? You are right Dave, new kit added, new parts added, fitments updated. All set, parts coming in soon for photos! How many miles before we should replace water pumps. I just got a CPO 2014 X-1 that had 19,980 miles on it. Test drove the 2016 X ! but did not like the electric steering. Personally once you tick over 50k I would replace it. That is on the very beginning of when these are likely to start having problems, but I prefer to do preventative maintenance to avoid being stranded and having to pay more and potentially have problems due to local shop availability. I am a DIY’er though, so the thought of changing it on a nice day with some sodas is much better than getting stuck somewhere and having to pay joe shmo 6 blocks down to do it, and have to pay dealer prices on the parts. I know the post is for an E90 but I just did this job as a dyi on a 2011 F10 535I xdrive M-Sport with the adjustable sway bars. There does not seem to be any info relating to this car and the job. Pump failed at 47,000 miles. After trying to follow 3 series and X1, X3 and X5 directions it was not possible on this vehicle. In the end the trick was to remove the upper support over the radiator and pull the fan out. After that the whole job could be completed with the large amount of space gained. That’s great info, I will add a note to the post. Thanks Dave, hope this will help others too in this task. How about those active sway bars huh? There’s an article on this blog about the system kicking around, very fancy. Thanks for the tip- I have the same car and will be attempting the repair soon. Going to the the OFHG, belt, tensioner, and front left axle all at the same time. 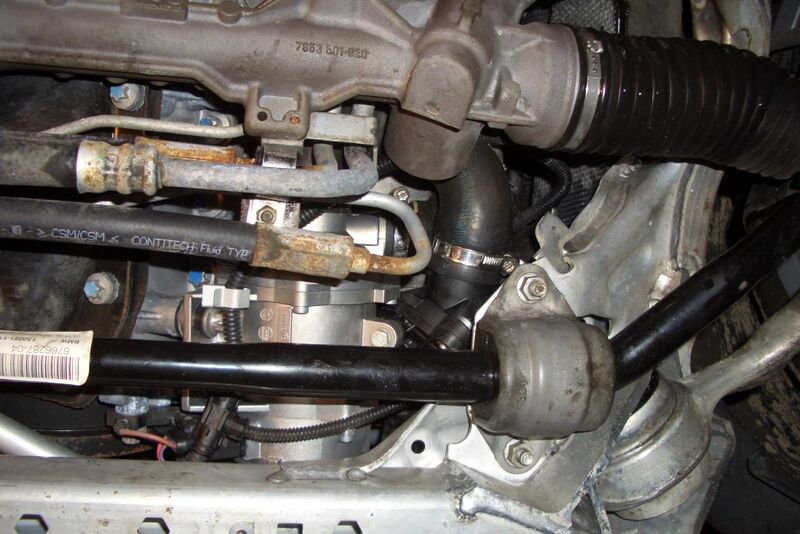 Did you have to disconnect the sway bar hydraulic lines to lower the sway bar enough to pull the water pump out? Did you remove the steering rack ? I have a 2006 330i. 166,000 miles. Still on original pump. Impressive, but definitely non-typical. I hope you are planning on changing it soon just in case? These are fun! (Not!) If you have the SAV active sway bar system, free the pump and pull out from up top. Everything else from underneath. Use lots of extensions and wobblys/swivels. 7mm with a universal and 1/4″ extensions will do the trick on those damn hose clamps. If you have a 535xi gather your patience because their evil. Enjoy your coolant bath and scraped up arms! Bleeding procedure:fill up expansion tank with BMW coolant (50/50 mix), leave the cap off. turn your heat all the way up with fan on the lowest speed. Then hold gas pedal all the way (you’ll feel a click in the pedal) about 10-15 seconds. Should hear the pump running and let it bleed it self remember to make sure your tank is full of coolant! Hi Suren, we offer a water pump or kit for your car to fix this problem. Tell me what your exact car is and I can advise you on a specific problem. Do not drive the car with a broken water pump. Be aware that if you’ve experienced a pump failure, and then replaced the pump and STILL can’t get the new pump to start the bleed cycle, it is possible the original pump failure also blew the fuse. TIP: That water pump circuit fuse is located in your ECU wiring box under the hood (ECU box is on passenger side – remove the cabin air filter assembly, then unsnap and set aside the wiring harness and sensor(s) on the under-cowling, unbolt that cowling and lift it out of the way. ECU box is that largish cream colored box on the passenger side. Unsnap the 2 lid locks, then two more lid snaps and lift off the lid. See a big mess of wires. Buried down in there somewhere is yet another virtually inaccessible “unified locking fuse block” – the style varies with the year and model – but the fuse itself is a standard automotive blade style 30 amp fuse. On (at least) 2007 328i series, it resides in a small r3ctangukar black plastic removable fuse block sub-assembly. That sub assembly unplugs for bench access, but then has a tab-locked slide-off lid which further prevents direct access to the fuses. Unplug that block, take it to your bench. Flip it over, using a tiny pointed tool, press both release tabs and slide the cover off to access the fuses. Note: Do not break at it off! Comment: THIS FUSE LOCATION AND ARRANGEMENT S A TOTALLY STUPID, UNNECESSARY AND DIFFICULT TO ACCESS PIECE OF OVER-ENGINEERING IDIOCY. BMW engineers pay attention: Inaccessible fuses that cannot be easily discovered or accessed for replacement are almost criminal in their negligence of design! THE WHOLE POINT OF A FUSE IS TO PROVIDE A KNOWN POINT OF FAILURE IN A CIRCUIT – ONE THAT IS EASY TO ACCESS! Well the whole point of BMW is to make money, and that sounds like some good labor time at your local BMW dealer to do. Who has any information about why does the water pump still in work even after removing the key for a long time until the battery goes off? Here’s the kit for your car, made from the same company that makes the Genuine BMW water pump and thermostat (which I would also replace while you have the cooling system apart): https://www.eeuroparts.com/Parts/68505/Engine-Water-Pump-And-Thermostat-Kit-N51-N52-N52N-100K10179/ It even includes bolts! They are one time use so they must be replaced. Well, how long does the pump stay on after removing the key?? This is normal .. occurs within a certain period of time after locking your car. Wouldn’t rush out to buy a new water pump unless thing was on for extended time.